Domaine d'Oléron luxury camping site is a holiday haven, perched on the idyllic Ile De Oléron, in Vendee. If you're seeking seclusion with a tranquil and easy-going pace of life, this well kept secret just might be for you. 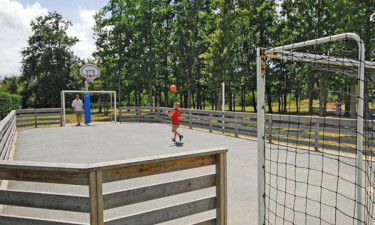 Tucked deep inside the lush forests of Saumonards, this holiday resort comes with fully equipped mobile home options. To make your dream getaway a reality, log onto LUX-camp today. 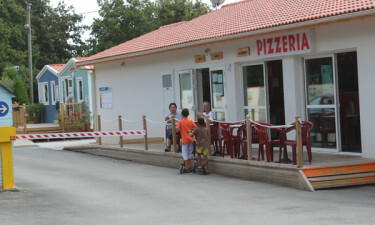 Welcome to Domaine d'Oléron Campsite. 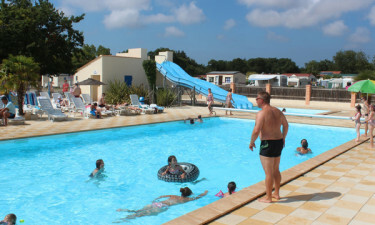 What's unique about a Domaine d'Oléron camping holiday? Enjoy island life in a peaceful atmosphere. Explore the island's treasures by bike. Exceptional choice of water-inspired activities to choose from. The best way to soak up all this beautiful island has to offer is to get on a rented bike and go exploring. The Plaisance beach, a long stretch of golden sand is easily accessible and the kids will enjoy some beach sports or a dip in the ocean waves. The Saumonards forests enclose the campsite and a bike ride through the majestic trees and rolling landscapes is well worth the effort. Drop into the lovely Jardins Botaniques de la Boirie and marvel at the array of rare plants. It has over 150 species of sage alone. While you're not enjoying your luxury tent or mobile home, this Atlantic coastal hotspot won't disappoint in the activities department. The resident water park is heated and provides lots of water slides and other water features for the family to enjoy. There's a playground and smaller pond for younger ones to splash about in. The surrounding areas also offer some choice activities like horse riding, scuba diving, canoeing, surfing and sailing opportunities, all of which are options promising to make your break a memorable holiday. Domaine d'Oléron is all about luxury camping but you can extend on that theme with a choice of gorgeous beaches and towns not far from the site itself. Of particular interest is the lovely tourist attraction Fort Louvois. It's said that when high tide hits this landmark, the 17th century fortress, looks like it's floating on thin air due to the foundations disappearing beneath the ocean. If you want to see this fort’s twin, ‘Fort Boyard’, you can take a boat tour which takes you around both. You might also want to ramble around the island on foot as the scenery is spectacular. The island gives you direct access to many shops and outlets, and is home to charming little bistros and coffee shops. While there isn't a restaurant on the site, they do provide a take-away service but you'll be spoiled for choice when it comes to local French cuisine in the surrounding areas. After you've walked or cycled this beautiful island, you'll no doubt want to quench your thirst in the Domaine d'Oléron Campsite bar. Don't forget to try a chilled glass of local vino.